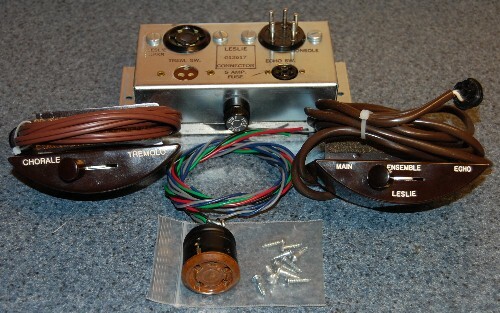 Console connector kit for Leslie 122 series speakers. Allows connection of the Leslie 122 family of speakers to Hammond organs with the AO-28 preamplifier (B-3, C-3, RT-3) and AO-10 preamplifier (B-2, C-2, RT-2). Includes mounting hardware. Can be used with A-100 and D-100 series organs with the addition of other parts. 1122 Connector Kit for Leslie 122 family speakers - connects to 11 pin outputs as found on Hammond XK-3 and XK-2 organs. 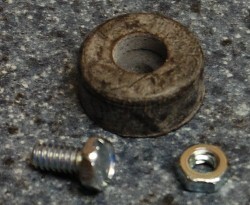 Includes mounting screws for permanent connection if desired. 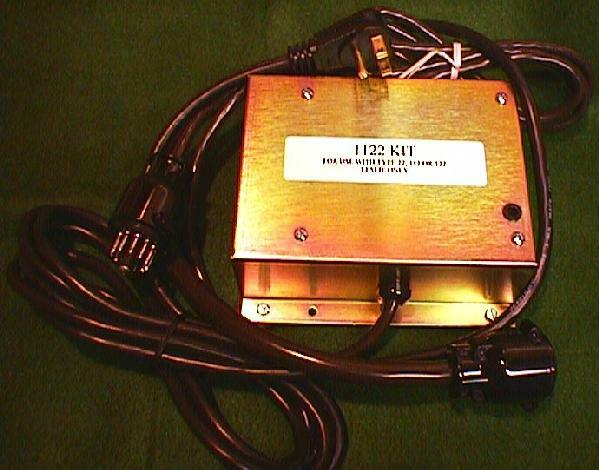 The 1122 kit obtains its power via an AC power cord. The 11 pin male plug attaches to the instrument and the six pin socket connects to the Leslie. Cord Lengths: AC - 112" 11 pin - 70" 6 pin - 17". IMPORTANT SAFETY TIP: Power off the keyboard prior to connection failure to do so can blow the audio chip. For information on our current price for this item click MAP. 1147 Connector Kit for Leslie 147 family speakers - connects to 11 pin outputs as found on Hammond XK-3 and XK-2 organs. Includes mounting screws for permanent connection if desired. 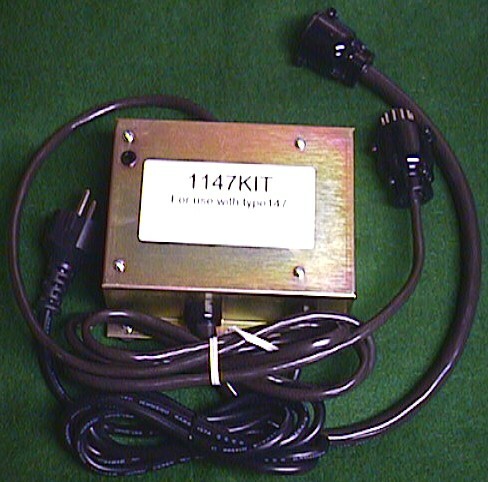 The 1147 kit obtains its power via an AC power cord. The 11 pin male plug attaches to the instrument and the six pin socket connects to the Leslie. Cord Lengths: AC - 112" 11 pin - 70" 6 pin - 17". IMPORTANT SAFETY TIP: Power off the keyboard prior to connection failure to do so can blow the audio chip. For information on our current price for this item click MAP. Replacement three position switch for Leslie console control centers that didn't quite make it through the door. 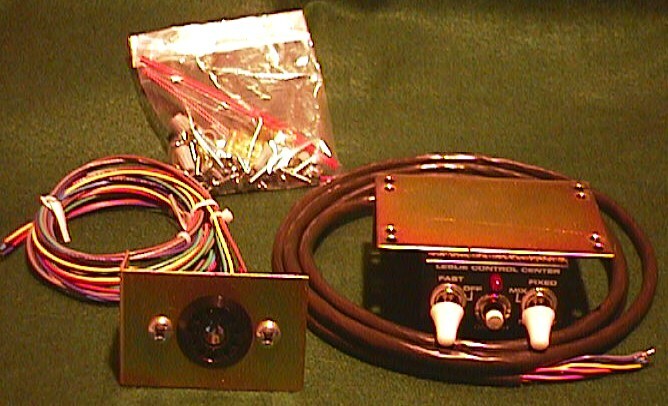 Hammond Suzuki 1174 Console Connector Kit for Leslie 11 pin tone cabinets with up to four channels connects to any one, two, three, or four channel organ. One use is connecting a Hammond A-100 series organ to a Leslie 122XB speaker. 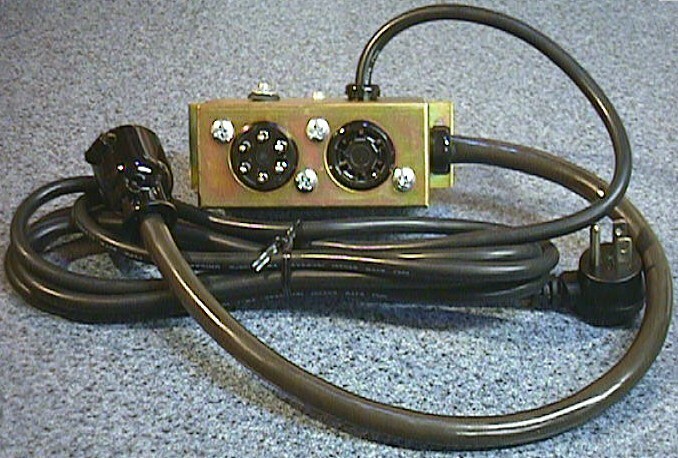 The kit contains a console connector assembly, console cable, and control center with mounting hardware. When properly installed it provides switching for Leslie slow/off/fast rotor speeds, Leslie power on/off, and main/ensemble/echo switching. Also provides mixing of a reverb channel into the rotary channel of a single channel Leslie. Includes detailed installation instructions. 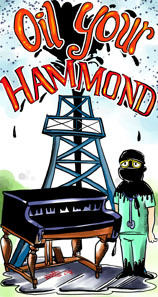 For information on our current price for this item click MAP. 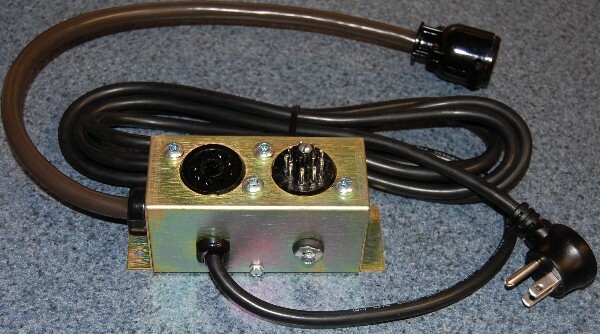 Hammond Suzuki 1188 Console Connector Kit for Leslie 11 pin, 2 channel tone cabinets \(315, 415, 422, 715, 722, 815, 822 and others\) connecting to B-2, B-3, C-2, C-3, RT-2 and RT-3 Hammond consoles. The kit contains a console connector assembly and control center with mounting hardware. When properly installed it provides switching for Leslie slow/off/fast rotor speeds, Leslie power on/off, and rotary/ensemble/stationary speaker switching. For information on our current price for this item click \MAP\. 1197 Connector Kit for Leslie 760/770 speakers - connects to 11 pin outputs as found on Hammond XK-3 and XK-2 organs. The 1197 kit obtains its power via an AC power cord. 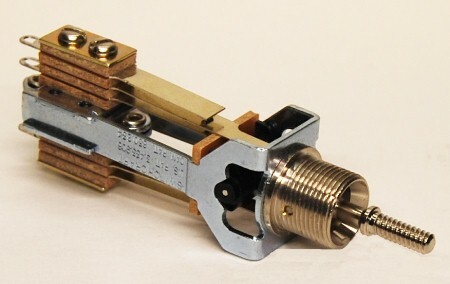 The 11 pin male plug attaches to the instrument and the nine pin socket connects to the Leslie. Cord Lengths: AC - 6 feet\ 11 pin - 6 feet\ 9 pin - 1 foot. \\IMPORTANT SAFETY TIP: \ \\Power off the keyboard prior to connection\ failure to do so can blow the audio chip. \\ For information on our current price for this item click \MAP\. Rubber foot and hardware for Leslie 1122, 1147 and 1197 console kits. For Leslie 9 pin cabinets like the 760/770 series, 825 and 900 series, or, when a Trek LCO-1 crossover is installed, the Leslie 710 and 720. 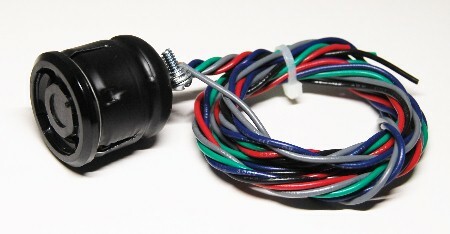 Connects to Hammond B-3/C-3/A-100 and earlier console models, as well as M/M-100 series, L-100 series and T series spinet organs. Kit includes a console connector assembly, console cable, and control center with mounting hardware. When properly installed it provides switching for Leslie slow/off/fast rotor speeds, Leslie power on/off, and main/ensemble/echo switching. 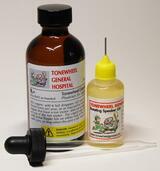 For information on our current price for this item click MAP. 6122 connector kit for Leslie 122 family speakers - connects to Hammond A-100, D-100, E-100, L-100, M-100, T-100 and their families, the B-3, C-3, RT-3 and their earlier versions, and the M, M-2, and M-3 organs. Allows use of internal speakers or Hammond Tone Cabinets with Leslie 122 family speakers. 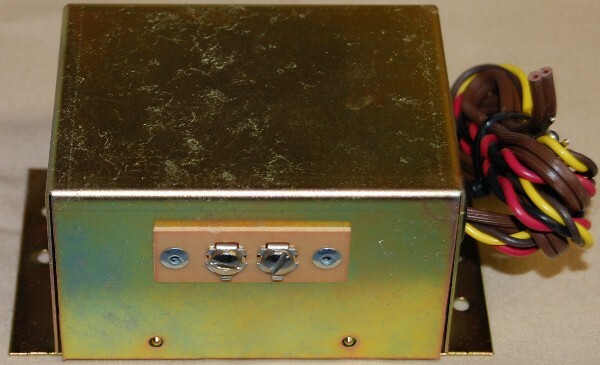 The 6122 kit includes a console connector assembly with 6 pin female Leslie socket, driver transformer assembly, console control center and all hardware. For information on our current price for this item click MAP. 6147 Connector Kit for Leslie 147 family speakers - connects to Hammond A-100, D-100, L-100, M-100, T-100 and their families, and the M, M-2, and M-3 organs. 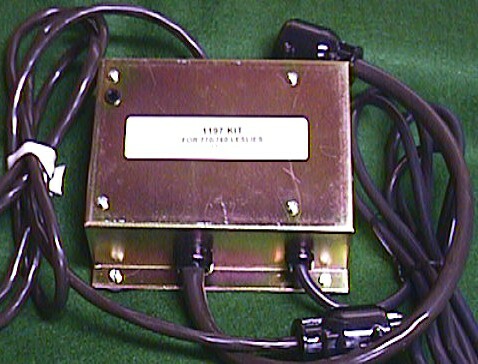 The 6147 kit includes a console connector assembly, console control center and all hardware. For information on our current price for this item click MAP. 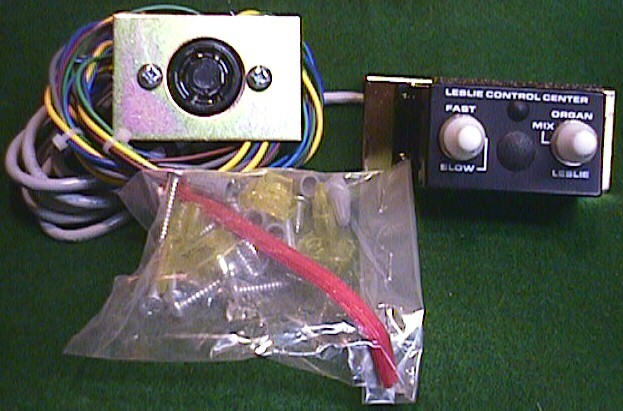 Always insure you are using the correct console connector kit with your organ and Leslie. 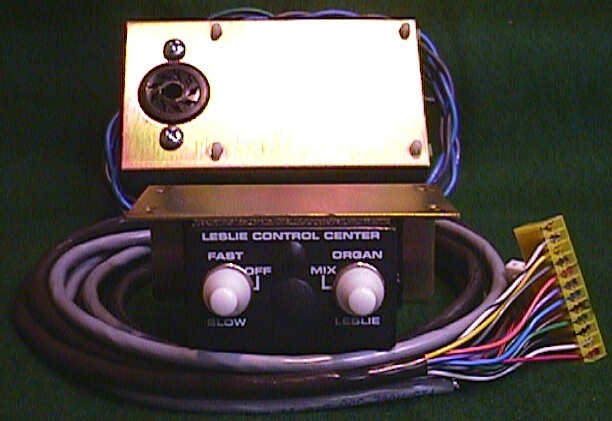 Leslie manufactured dozens of kits for numerous organ and Leslie combinations over the years. 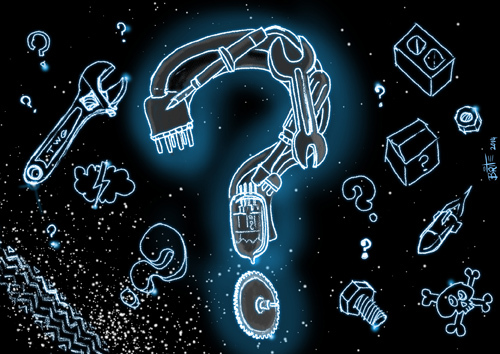 While externally some look like they will interface correctly, internally they may not be compatible. Call or write if you are not sure about what you have or might need! New five pin female Amphenol socket with metal shell. Wires for AC (blue/gray), signal send/receive (green/red) and ground (black). Power wires are 36" long; signal/ground wires are 24" long. Includes installation instructions for A-100, M- and L-series organs. 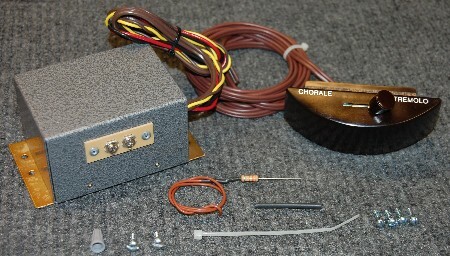 Allows connecting two Leslie 122/142/222 or 125/145/147/247 speaker cabinets to an organ. Also works with earlier 21H/22H/31H and 25/44W/45/46W/47 models. Cannot be used to run 122 and 147 Leslies simultaneously. Not for 51/251/351 Leslies. 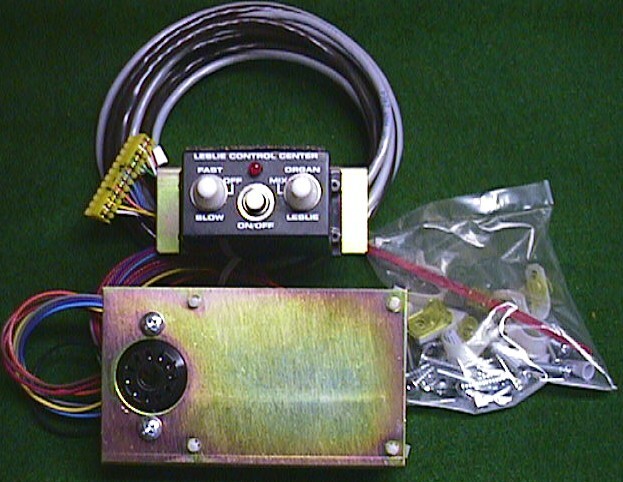 Allows connecting two Leslie 700/710/760/770 or 900 series speaker cabinets to an organ. Special item not listed in the parts catalog. Type in the order form comments section the item and pricing information, or the invoice number if we have provided one. 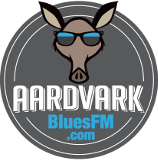 If you are paying for service work on an amplifier or speaker the invoice number is all we need. The web site will default to $0.00 for the cost and 0.1 pound for shipping weight. Your shipping cost and order total will be calculated manually. The comments section is the only place to enter information. You can not change the pricing and weight figures, so stop trying! 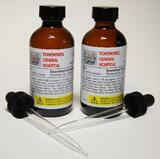 Tone Generator Oil Pair - Buy Two and SAVE!